Gumbo is as Louisiana as the Saints, brass bands, Huey P. Long, bald cypress trees, and alligators. 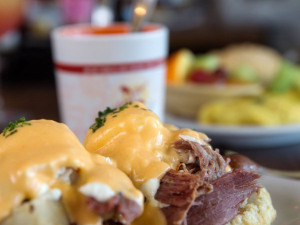 Although it should always start with a roux, gumbos found throughout New Orleans (and beyond) are as varied as Mardi Gras krewes. Almost every year, you will discover chefs creating their own interpretations of this classic dish, much to the joy (and chagrin) of locals. Because gumbo was a dish born by incorporating the seasonings and cooking techniques of many different cultures—French, German, Spanish, Choctaw, and African—I have no problems with new and interesting “variations on a theme,” but I know it's a touchy subject. There are also hundreds of gumbos in Orleans Parish alone, and I have tasted only a small percentage of them. But honestly, can there ever be too much gumbo? If you've never set your lips to a spoonful of this heady stew, I've quite a few suggestions, from new restaurants and old. The best part? Gumbo is almost always under $20 for a bowl; in fact, some are even under $10, and it's so thick, rich, and chock-full of meat or seafood, it easily makes a satisfying meal, especially with several slices of New Orleans French bread on the side to sop up every drop. Where to start but at the beginning? At Antoine's, easily the oldest restaurant in the country, there's the classic “Gombo Creole,” which is overflowing with shrimp, blue crab, and oysters, at only $10 a bowl. Even I can afford to dine at Antoine's if I go straight for the gumbo. Dooky Chase's has been serving up Creole Gumbo since 1941, a thick stew that also has shrimp, crab, and oysters, plus smoked sausage, hot sausage, brisket or veal, and smoked ham. You'll have to get a reservation for Holy Thursday if you want to try the Gumbo Z'herbes, a beloved pot full of tradition with tons of greens (spinach, turnip greens, mustard greens, collards, Swiss chard, and kale), seasoned with pickled pork. 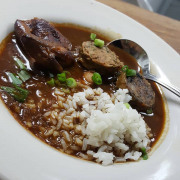 Chef Frank Brigtsen, who candidly admitted to me that he devours gumbo on the daily, offers a filé gumbo with rabbit and andouille sausage at his Riverbend restaurant, Brigtsen's, for $9 per bowl. And not only will you revel in his delicious gumbo, you will be treated like a member of the family. In Mid-City, Ye Olde College Inn is currently serving a turkey and andouille gumbo for $8. Add a plate of their BBQ shrimp or a “famous” stack of onion rings, and you'll be stuffed till morning. The Bombay Club in the French Quarter has a smoked duck and andouille gumbo served with Creole potato salad, an addition I personally prefer instead of rice. Plenty of newer restaurants are serving up a more classical gumbo, and believe me, they are doing it oh-so-well. 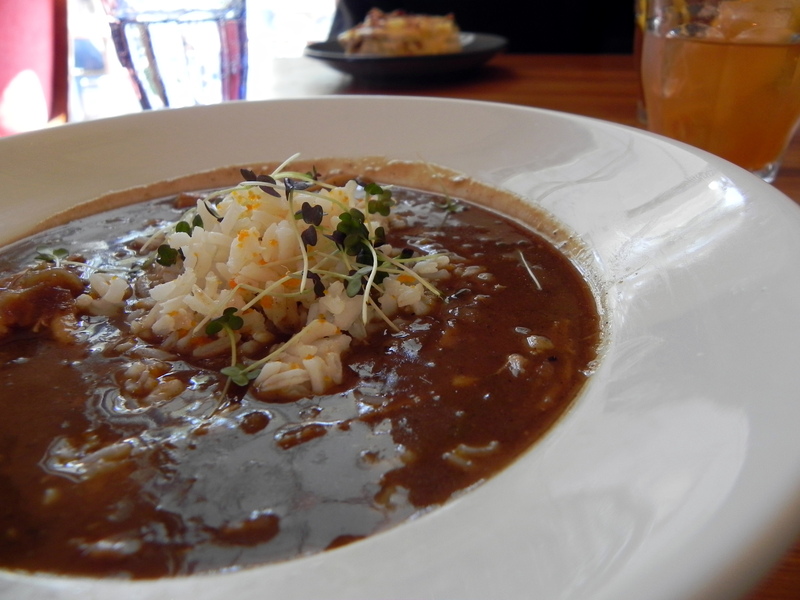 Avery's on Tulane offers a dark seafood gumbo with crab and oysters ($10.25) or a chicken and sausage gumbo ($9). It's certainly tempting to order their fried potato salad along with it. Over on Freret Street, High Hat is offering a Chicken & Andouille Gumbo Ya-Ya, a thick and dark roux-based stew with loads of chicken, for $8 per bowl. It’s a dish that goes well with a side of braised greens or sweet potato salad. And if you're looking for an incredible lunch combo, head over to Central City for a combo of filé gumbo with rice, a grilled cheese sandwich, and potato salad for $10 at Heard Dat Kitchen, a spot I would never have discovered without the help of NOLA food goddess Lorin Gaudin. 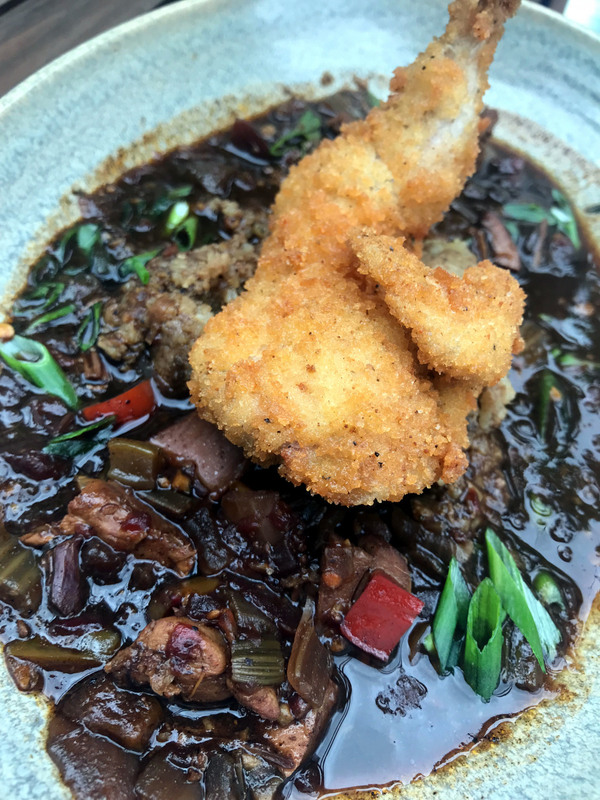 For something a little different, you can start with the Tabasco pulp roux-based chicken and andouille sausage gumbo at Cavan (pictured above). Thibodeaux-born chef Nathan Richard is offering a bowl at the Uptown restaurant for $9, meaning you'll have plenty of money left over for some corn fritters with honey butter or a glass of wine. Another slight twist can be found further Uptown at Patois, on the corner of Laurel and Webster, where you can currently score a hearty bowl of wild boar and chicken gumbo for $9 and still have enough left over to treat yourself with Chocolate Budino (a.k.a. pudding) with mint Chantilly and a cookies-and-cream crumble. 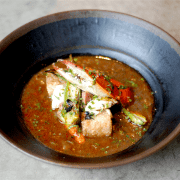 Easily the most expensive, though still slightly under budget, is the “Death by Gumbo” at R'evolution, the uber high-end restaurant by chefs John Folse and Rick Tramonto in the French Quarter. Made with roasted quail, andouille sausage, Louisiana oysters, and filé rice, this bountiful bowl will set you back $18. If you're not prepared to shell out that kind of cash, you could try a less-expensive version at Copper Vine (pictured above) , where Executive Chef Mike Brewer is wowing diners with his quail and boudin gumbo for $10, leaving some financial wiggle room for a plate of deviled eggs made with jumbo lump crab. 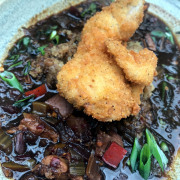 Or, you could head over to the recently re-opened Gabrielle in the Treme for a bowl of Chef Greg Sonnier's smoked quail gumbo, made with anise-flavored green sausage and popcorn rice for $12. Finally, for something completely different, head Downtown for a big bowl of Chef Michael Gullotta's blue crab and fermented black bean gumbo with roasted okra, andouille, and rice fritters at Maypop (pictured above). 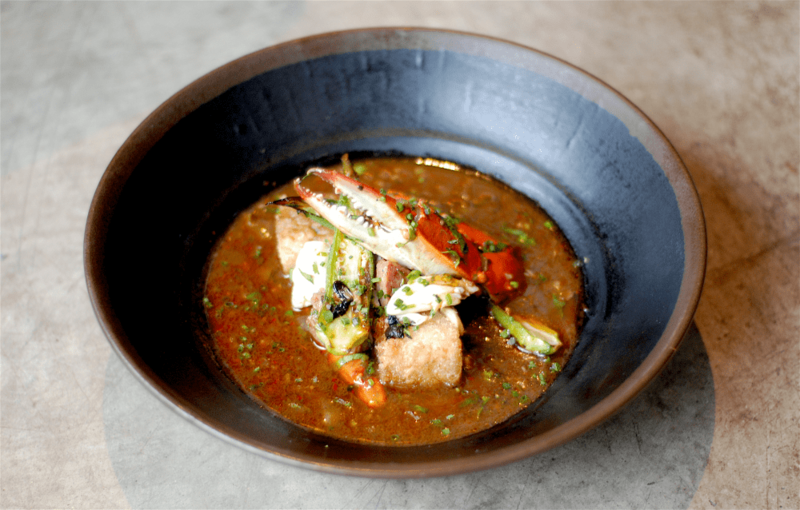 Though this unusual dish of gumbo will set you back $14, it's sure to blow your mind and elate your palate. Although it feels like I've been rattling off a long list of favorites, believe me when I say I've barely scratched the surface. I only wish I could taste gumbos lovingly prepared in the family homes all over Louisiana. Where do you go for gumbo?